Problem: Paper-crafting is always more fun with two, but I don't live close to any paper-crafting friends. Solution: One of my friends and I decided to make a weekly challenge between the two of us last year. 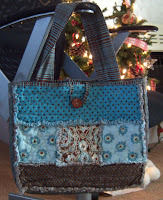 Each week we alternated in picking a "challenge" (example: Sea themed, stitching, No layers, recycled etc.) 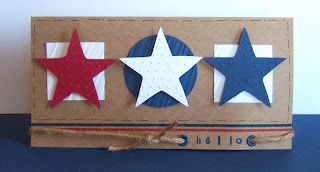 and would post our cards together on the following Wednesday. 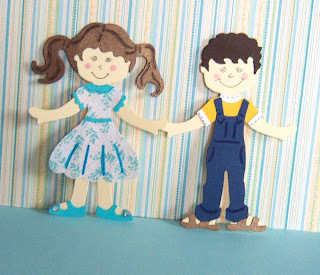 In this way we enjoyed scraping "together" though we were far apart! This year I ask her if she would like to change the challenge a bit. 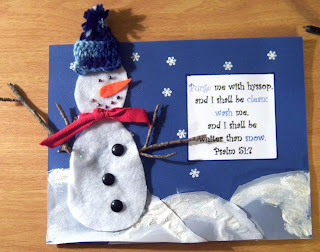 My plan is to give more homemade things for Christmas this year (and her's is too! ), so I thought it would be fun to make a calendar "together" as our challenge for this year. Each month we will post a calendar page for that month (only with next year's date on it) on the last weekday of the month. Come Christmas we should have some homemade 2012 calendars to give away as gifts! Since my attention span isn't very long, and I wanted to make at least four calendars to give away ---I decided to make the other two in a different design/theme. Each month of the second design will have a different patchwork quilt at the top! 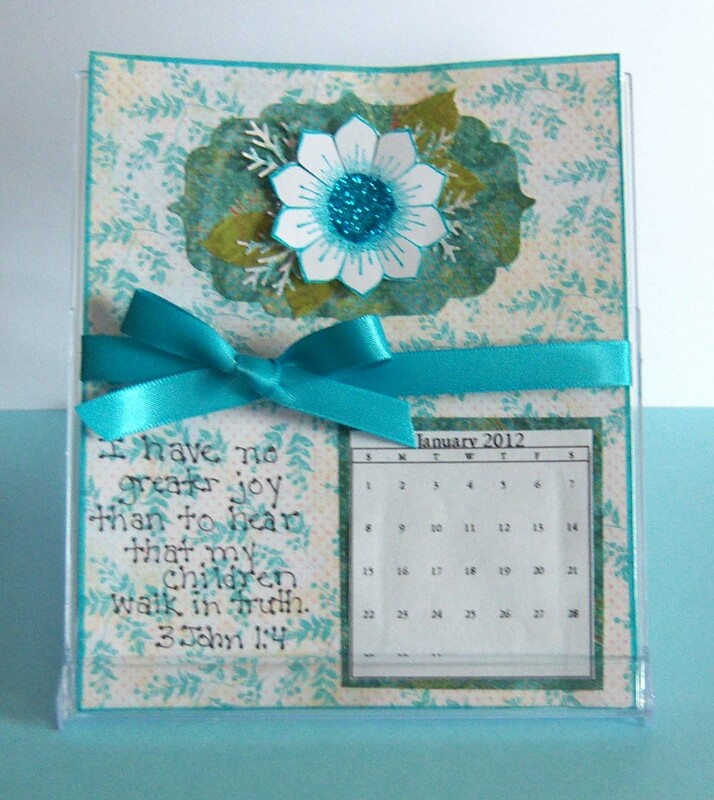 I have a very special friend who enjoys sewing/embroidery and I think this calendar will be perfect for her. Here's a little closer view to show you all the faux stitching I added to this with a black felt tipped pen. It was a bit time consuming, but well worth the effort in the end!! I really like how this one turned out - not sure I'll be able to give the second one away! 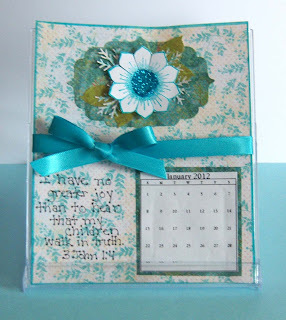 Now go here to see what my friend came up with for a calendar page this month. Anyone who wishes is welcome to join in on the challenge by leaving a comment and link to your own calendar post! 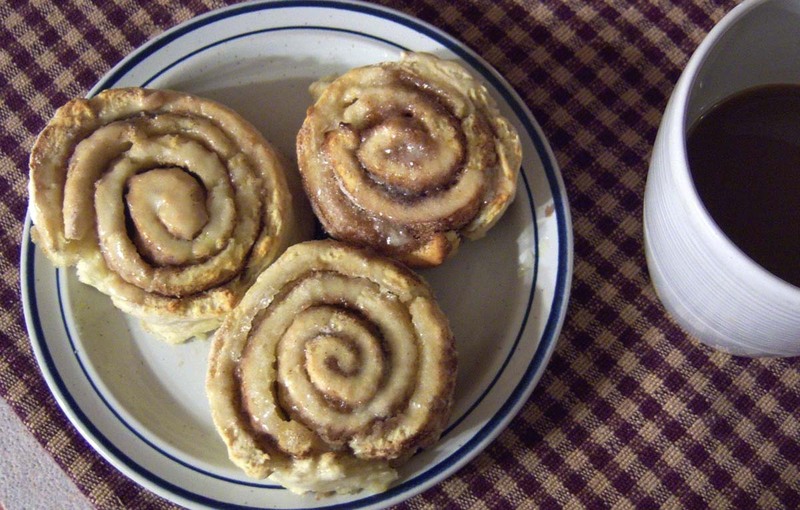 I never buy the biscuit baking mix - instead I make my own. Here's the recipe in case your interested. I got the idea for punching the sides of my card with a border punch from this lady's blog post. 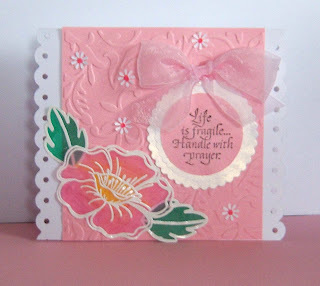 I think it adds a lot to the card and gives it a "softer" feel. 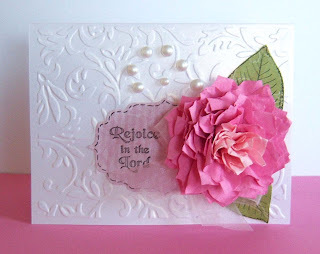 I also used a "new to me" technique on this card --- stamping on vellum and coloring the back of it with markers. 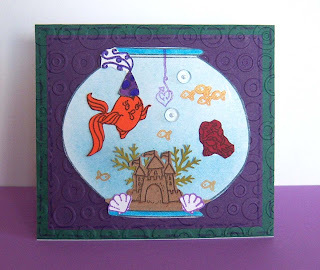 I used embossing powder to make the image stand out and then turned it over and colored the back with my Bic markers. Really liking how it looks on the card....come back next week for a masculine card using the same technique! A simple thinking of you card I made to send to a girl who recently lost her grandpa. 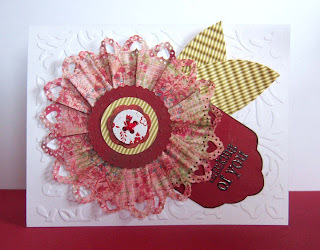 I used the crimped flower method that I posted about previously on this blog (click here to view). I also did one in blue - I changed out the black embossing powder for some blue ink on this one! Here's a fun card I created last week using the Red Got Flowers my daughter gave me for Christmas! Love red and black together --- this was a fun card to make! Well there's no danger of me running out of occasions to make cards. This year has started out with PLENTY of them - in fact I'm having a hard time keeping up! 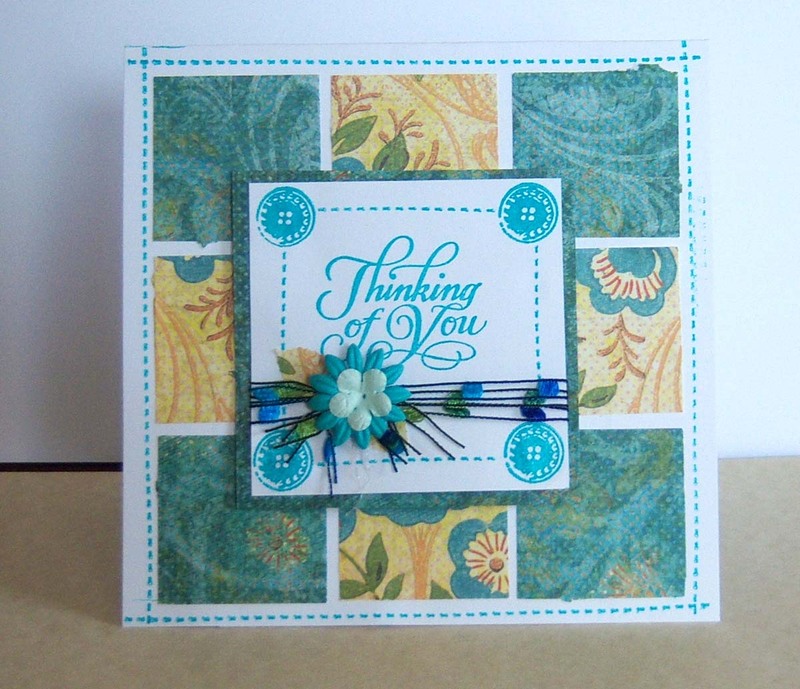 This is another sympathy card -- I actually made two in this same design and I've already used both of them! 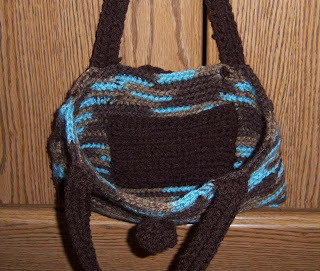 Here's another fun little purse I made. These are so simple that even a non-paper-crafter could whip one of these up in no time. 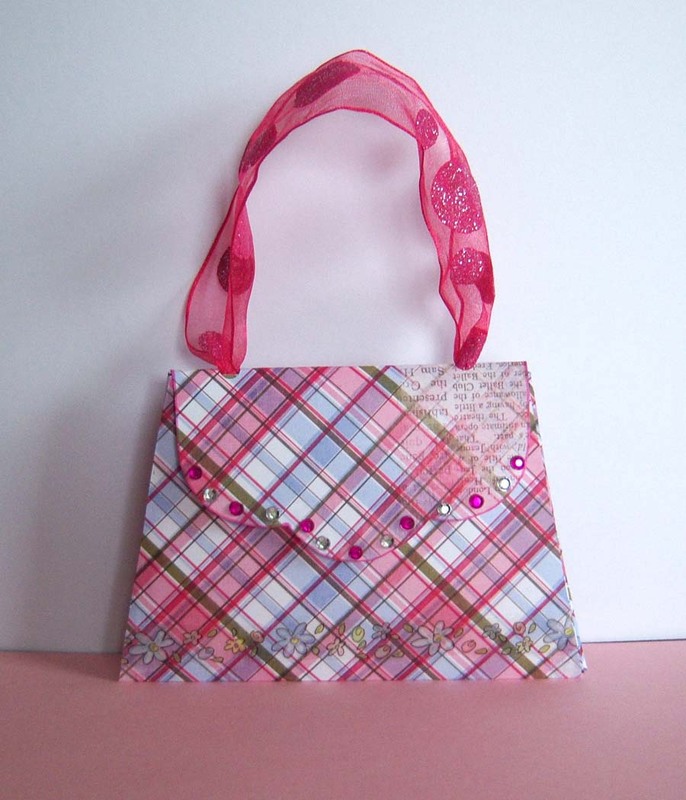 I added some "bling" with the rhinestones around the flap and a clear floral border across the bottom. The closure is sticky backed velcro dots. If you're interested in making one you can find the template here. The cool thing is this one has sides so you can open it up and put stuff inside -- like a little note and a few $$ for a special little girl's birthday! Or maybe some chapstick and a mirror for a favor at a birthday party. 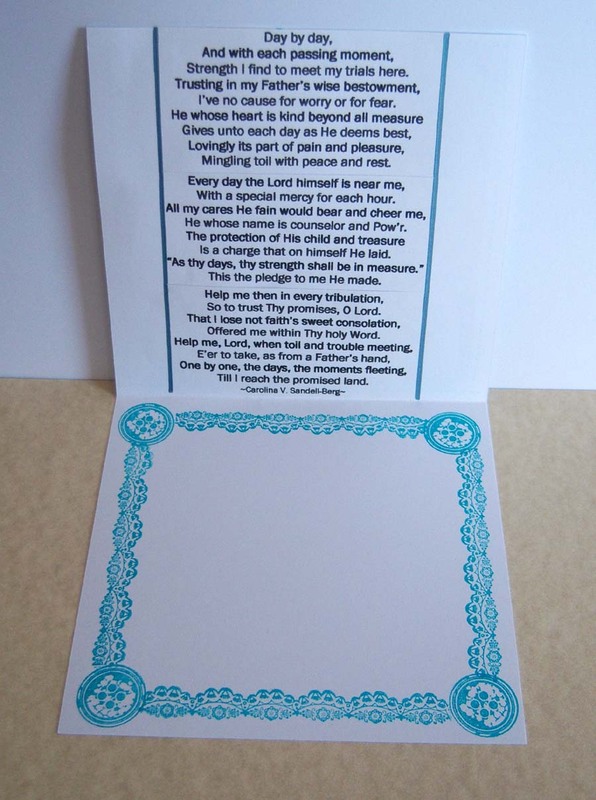 BTW - I copied and pasted the template in my Word program so I could enlarge it to fit a 8.5 x 11 inch sheet of paper. Adding links to some of the previous ones I've done so you can see the different ways to "decorate" them. My daughter loves to give gifts almost as much as I do! Since I'm not a millionaire, it can get a bit costly to buy/ship presents to all my family members and it's doubly so when my daughter wishes to join in! Now I certainly don't want to discourage her giving spirit....time to get creative. Recently one of my nieces turned 5 years old, and her cousin (my daughter) wanted to send her a gift. She made her a card using the Dress Ups Sizzix dies - that gave us the idea of sending her cousin a set of people (with accessories) to make for herself. After we die cut all the pieces out, I realized how confusing it might be to get an envelope full of dresses/shirts/shoes/hair for boys and girls! 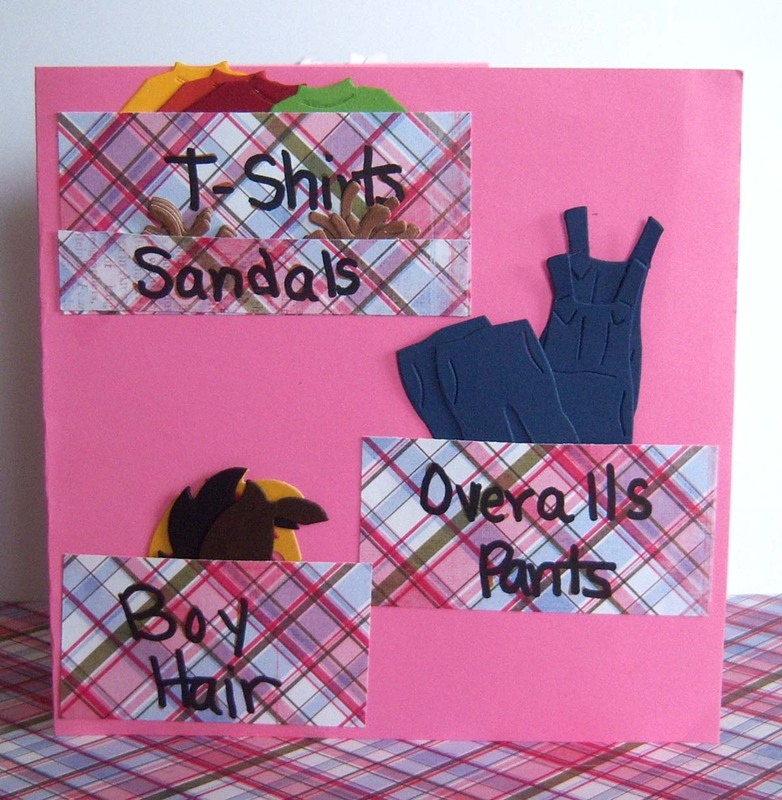 So.....we made a little card with pockets to put each separate item in. It's nothing fancy but it does the trick of organizing things nicely. We included enough supplies for her cousin to make 4 girls and 4 boys. Hope she likes it! I got most of these dies last year on clearance at Michael's and one or two as gifts. If you're interested in purchasing some for yourself ...You might check the Sizzix Outlet to see if they have any on clearance there.. 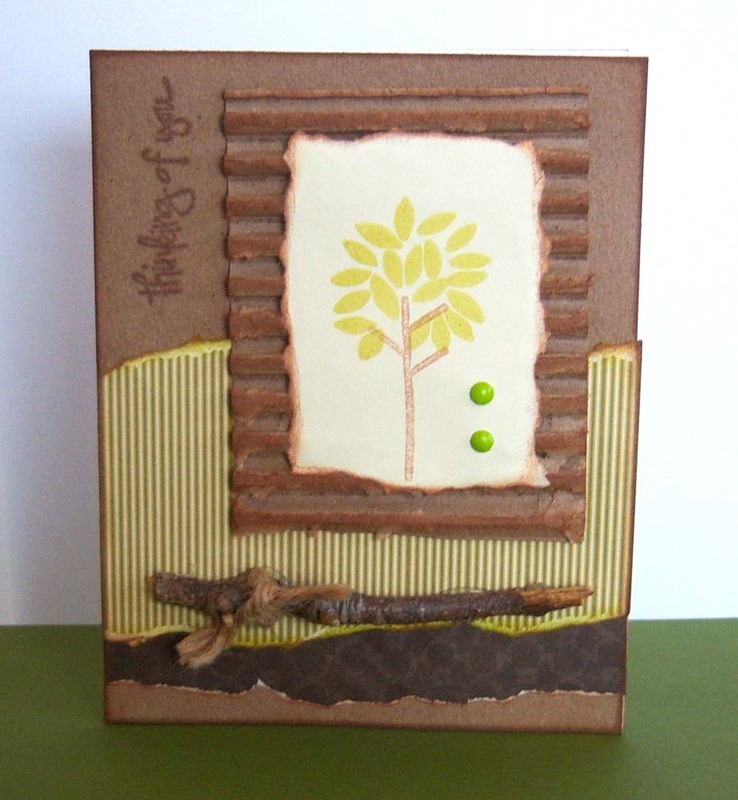 The inspiration for this card pocket came from a stamper on Splitcoast -- click here to view. Obviously, the only thing I kept the same was the shape -- everything else I changed out. 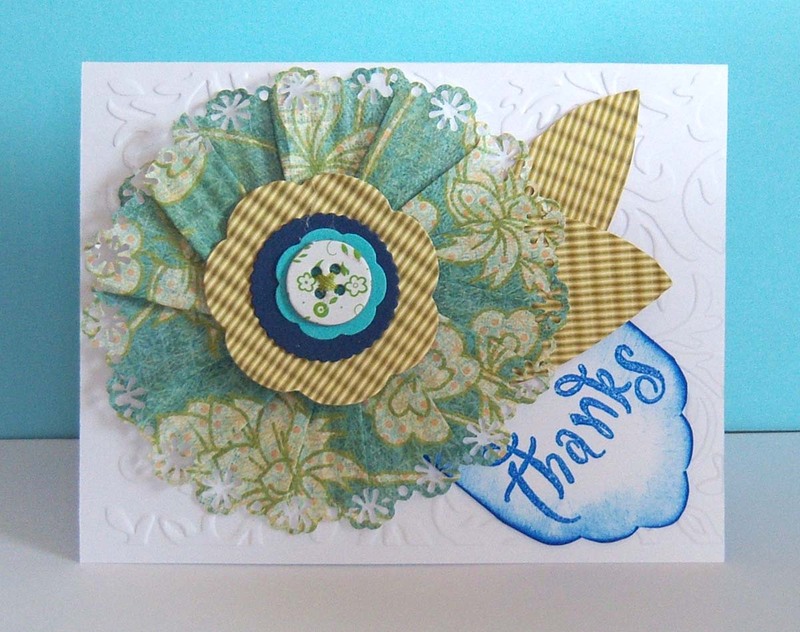 I had such fun using the Sushi Bowl Party Stamp Set (from Stampendous) and just couldn't stop with one card. Actually I sometimes struggle with making kids birthday cards - especially if they are for boys! Decided to make three of the same design (different color schemes) and add two of the cards to my small stock to be used at a later date! 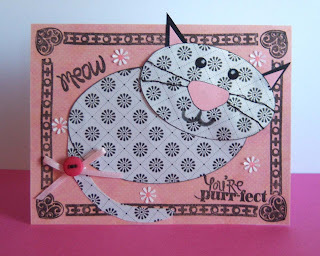 Besides the stamp set, I used misc. scrap papers, crayola markers, chalks, and an embossing folder (can't remember the name of this one!). 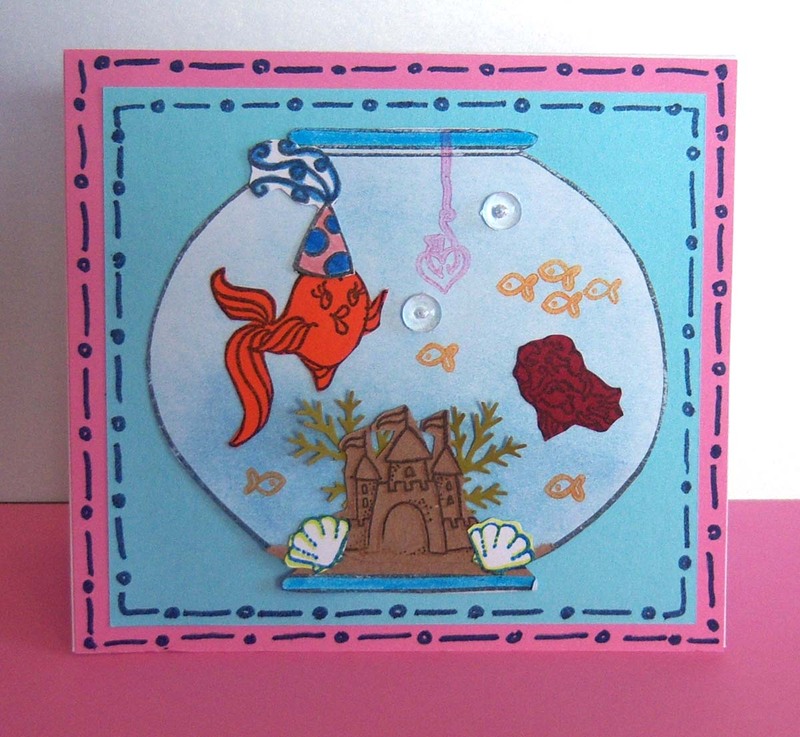 Forgot to emboss this one before I attached the fish bowl, but it turned out o.k. anyway! 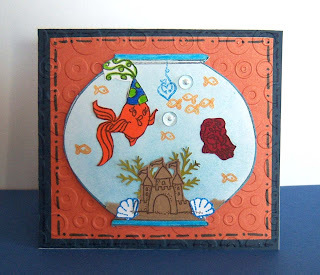 Here's a card I cased from an old Paper Crafts magazine. I'm not one to copy cards exactly, but this one is pretty close to exactly the way it was presented. I think it could go either way --- a masculine or feminine card -- maybe I'm finally catching on to the masculine thing!! 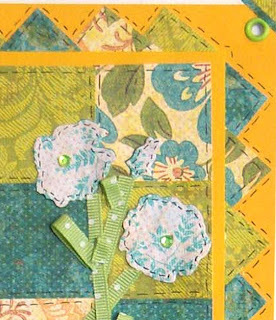 I love flowers and more often than not I find myself using them on the cards I make. 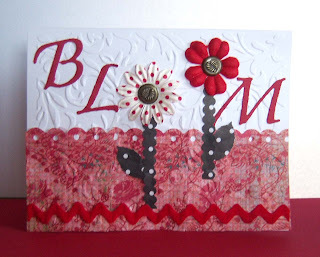 I love finding new tutorials showing ways to use what you have to make beautiful blooms for adding to your projects! 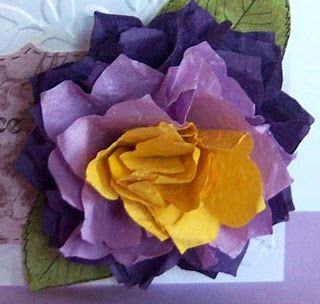 I've used the stacking nestabilites technique before and also the broken fibers - pealing apart paper layers technique, but I don't think I've ever combine them like the "Beautiful Flower" tutorial on the side of my blog does. 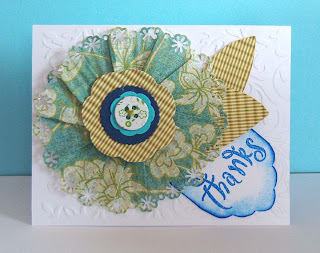 (Just found this tutorial last week -- you're going to love the watering pot she used her flower on, and thankfully she linked to the template as an added extra!). I'm still not 100% sure I like the way the card turned out, but it's too late now -- everything is securely fastened in place! I don't think you can see it in the above picture, but I embossed each layer of this flower with my Script (Provo Craft) embossing folder! It gives it a tad more texture. 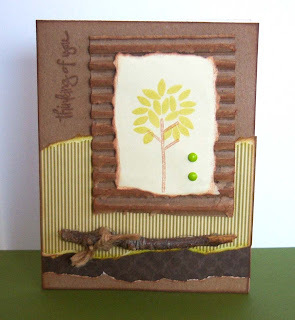 Leaves can be punched or free hand cut as well -- this is a very do-able project! A snow-man-loving friend of mine ask me to make her a special card to give to a recently made friend. She wanted something extra special with an extra special saying inside! Tall order! 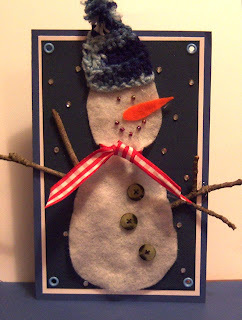 Since it is January.....since my friend LOVES snowmen.......and since I made 3 snowmen like this when I made my bulletin board decoration for this month --- I decided to make her special order card in the above design. 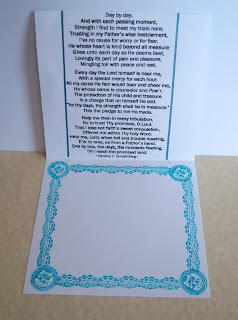 I found a friendship poem from this page that fit the bill -- thought I'd share the link in case anyone else likes to use poems inside their cards and needed a source for them. A family friend (in the Navy) is being deployed today and will be gone from 6 to 8 months. 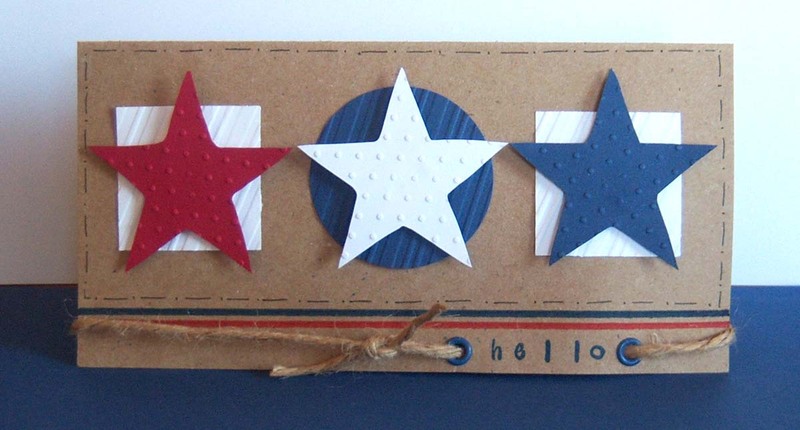 Made this card to send to him sometime during his deployment - that's the reason for the patriotic colors in January! 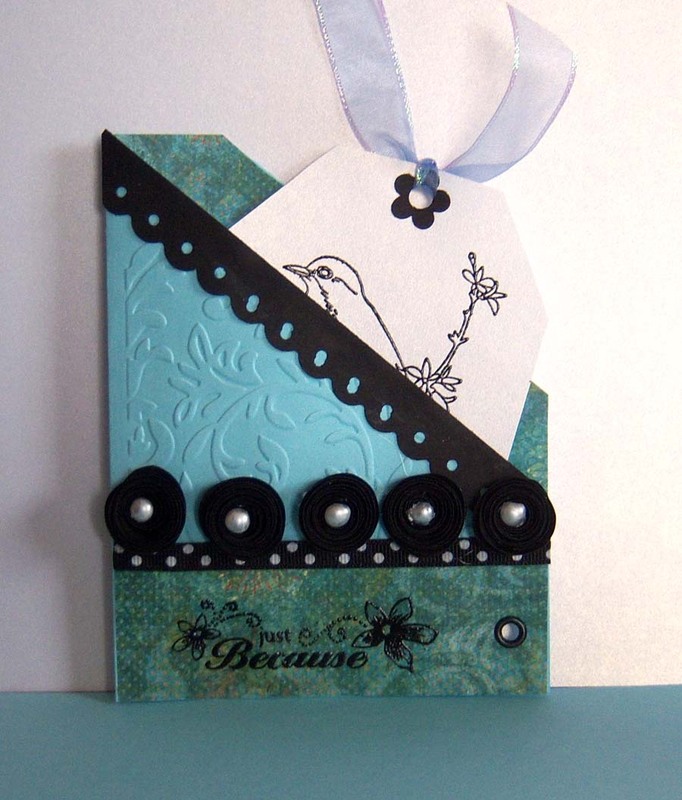 I actually made two like this -- I'm keeping one back to use as a masculine birthday card since masculine cards are NOT easy for me to come up with and I liked how this one turned out! 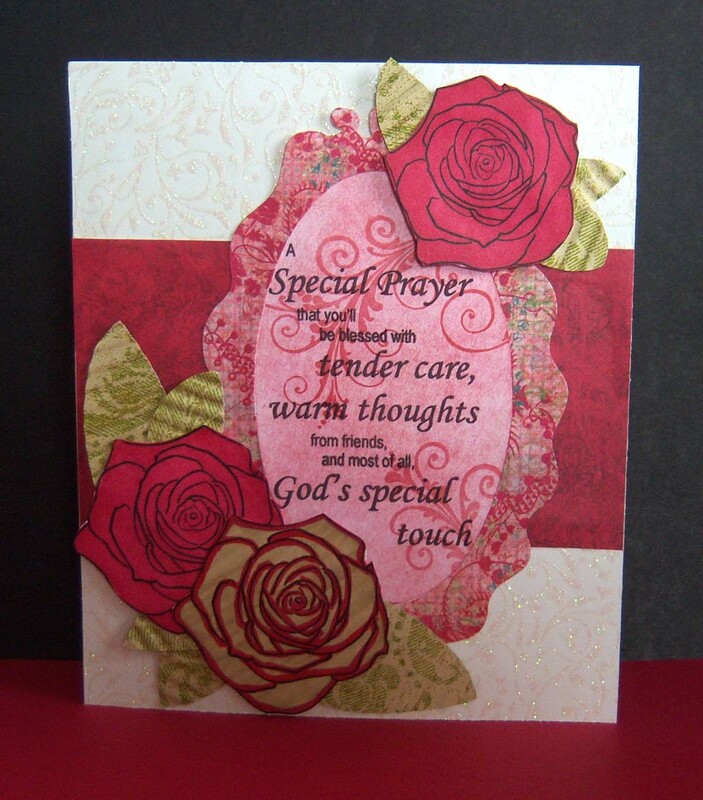 A sweet lady from our church lost her son this past week -- I wanted to make her an extra special card to let her know how much I care. 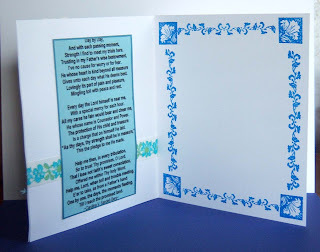 For the inside of this one I used the same old hymn as yesterday --- Day By Day and stamped a border on the other half to write my message in. yes I know I use them a LOT -- I LOVE the set I got at Ollies last year - some of my favorite paper! Happy Birthday to my sweet niece - Olivia Grace! 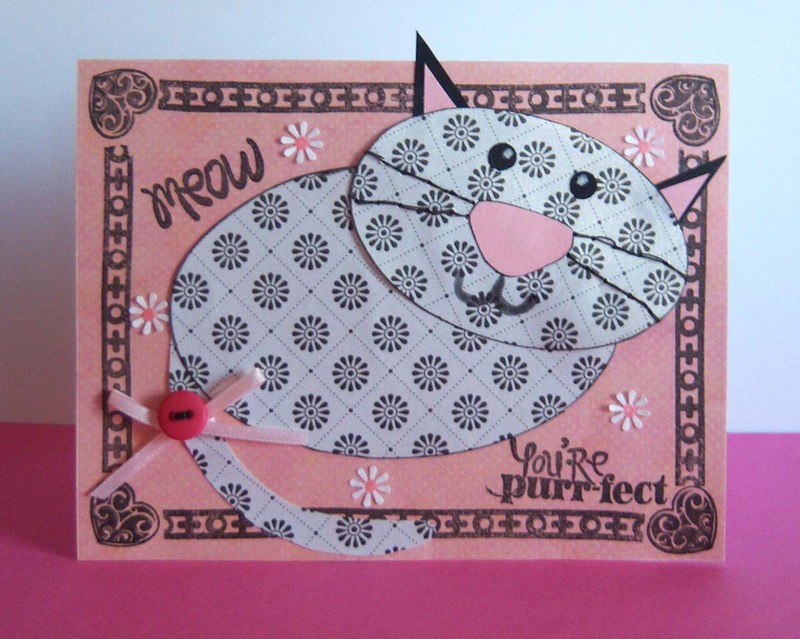 This is her birthday card - a cute little paper pieced kitty. 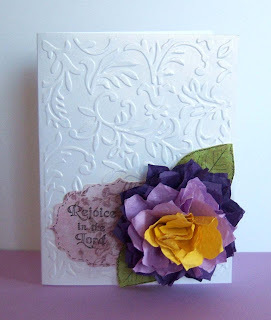 I got the idea for this card from a Paper Craft Inspirations Magazine. Here's hoping Olivia has an extra special birthday today!!! 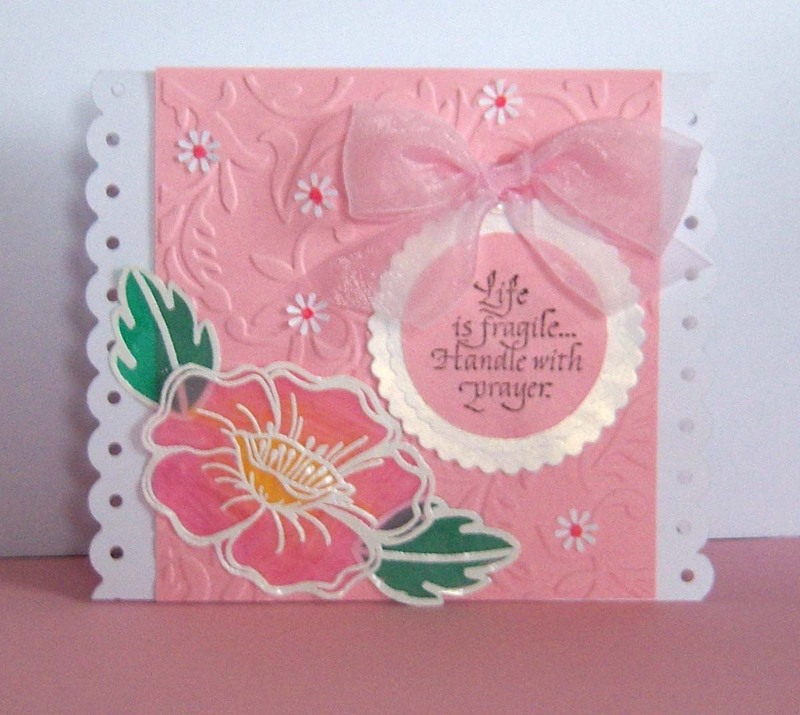 I have two friends who are hurting right now and I wanted to make them a special card to let them know I care. 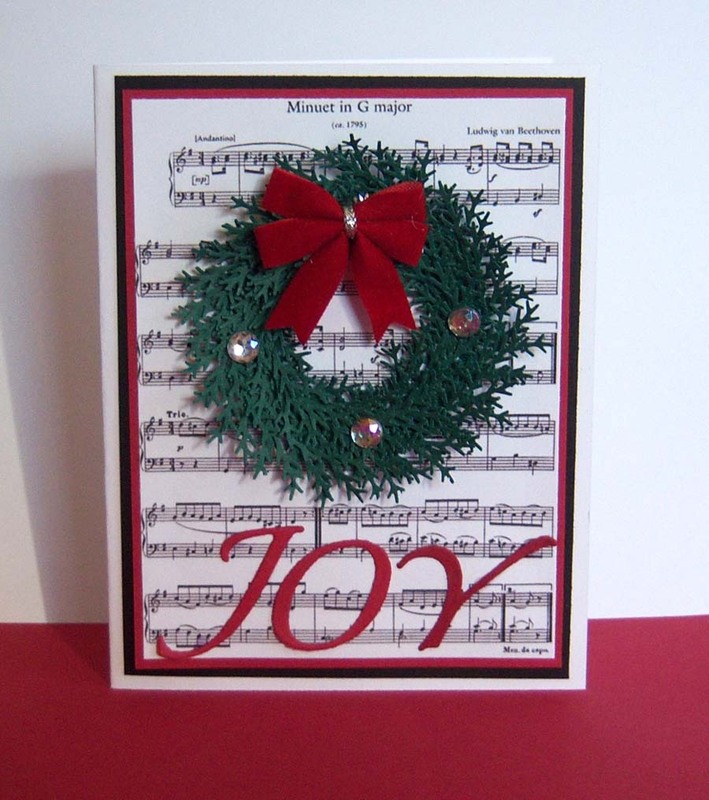 I made two in the above design and included an old hymn inside the second one...."Day By Day." Here's hoping it brought a little cheer to their day and let them know they're thought of and cared about! 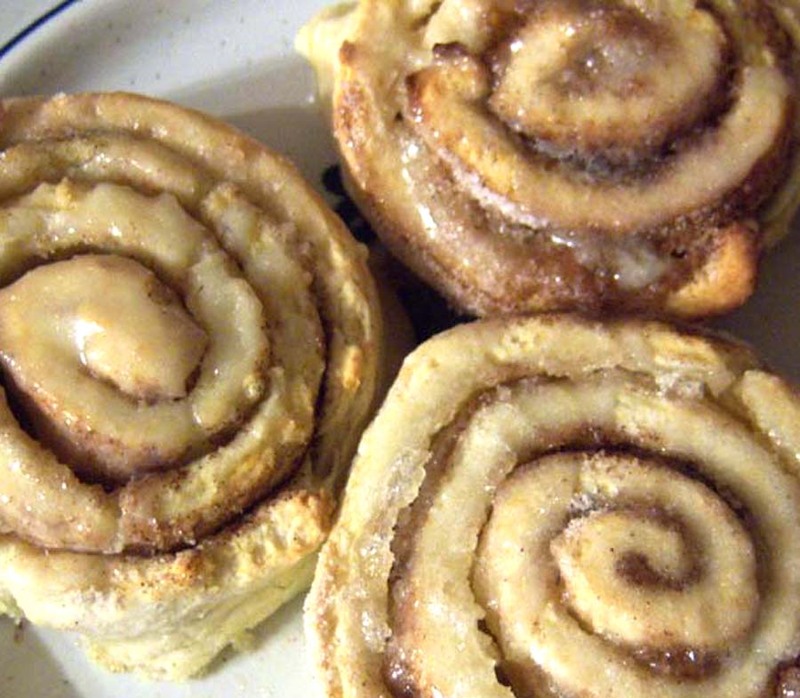 There's nothing that says "I love you" like a homemade - from the heart gift! I don't usually make a big list of New Year's Resolutions, just a few "character related" things that I especially want to focus on in the coming year......but this year I added "make more homemade gifts for Christmas" to the list. I realized that in order for that to happen, I was going to have to work on them all year long instead of waiting till November to start.........waiting that late finds me scrambling and not accomplishing as many as I'd like. I taught myself to crochet (using a book) a few years ago, and find it a relaxing and portable hobby. While it's impossible to cart around all things necessary to sew, scrapbook, or make cards, it's easy to grab my crochet bag and take it nearly anywhere with me. 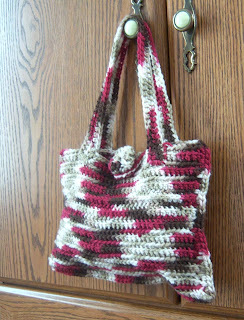 So.....the above crocheted pocketbook, is my first homemade gift for the Christmas stash....unless I use it for a gift before then as I tend to do! 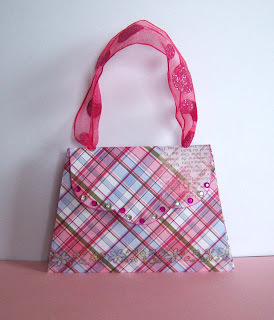 Purses are so much fun to give to little girls, especially when stuffed full of "girly" goodies - pens, notebooks, chapstick, gum, candy, etc. 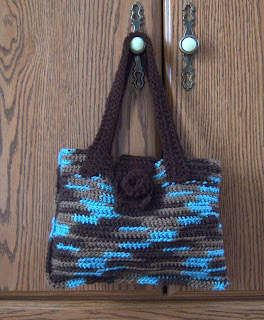 Here's another bag I made in the same design, the only real difference is that I didn't use the dark brown yarn to accent and the closure strap is different. I made this one while I was home for Christmas, and I've already filled it up with goodies and given it away. I've never written a crochet pattern before, and I don't think I'll attempt it yet......but I will tell you the entire purse is made using the Half Double Crochet (Hdc) stitch. 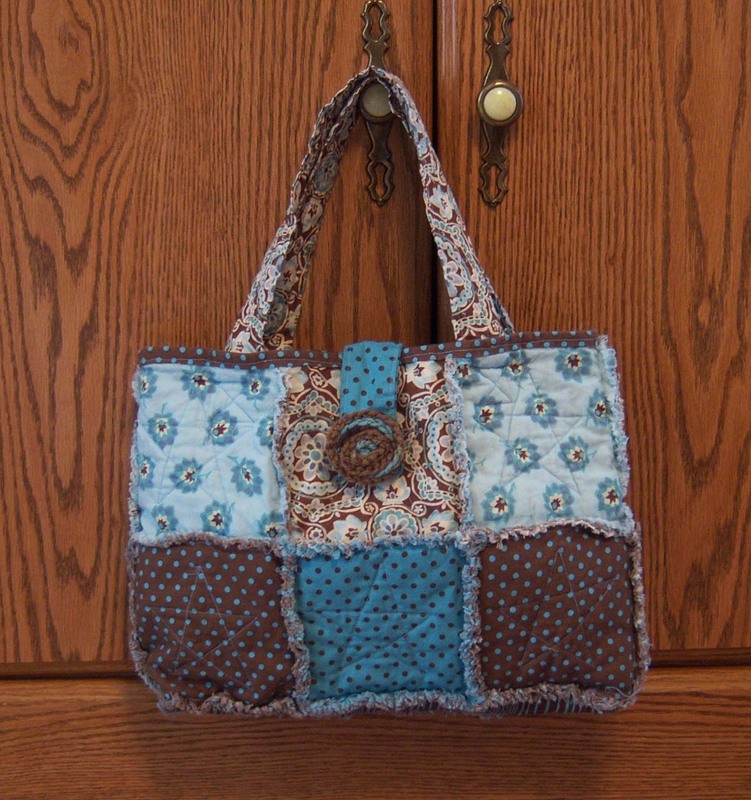 You have only to figure out how wide and how tall you want things (purse, straps, pocket, closure) and chain that many stitches. 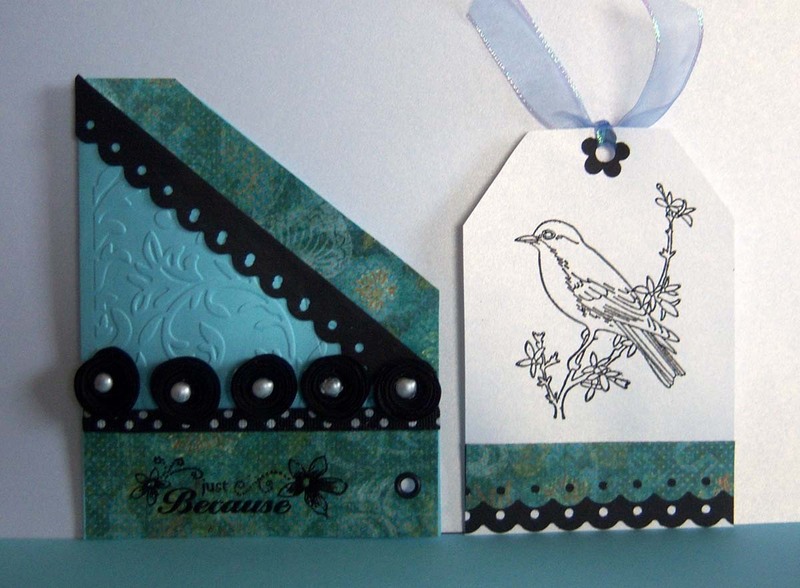 If you hdc in each one till desired height/width you'll have your own creation to post about! A church family gave my daughter Felicity for Christmas this year. She is more than thrilled with her, and still can't believe she owns an actual American Girl doll. Two years ago we had given her Targets version of the American Girl doll along with several outfits from there. She pretends that this doll is Elizabeth - Felicity's friend -- and has had the most fun playing with them this past week! I also found an ebay seller that makes beautiful clothes for American Girl dolls AND ships your whole order for the price of one outfit should you order several. (The tank top and jacket on the look-alike doll came from her). I'm linking to her because she makes period outfits for each doll and her prices are very reasonable! 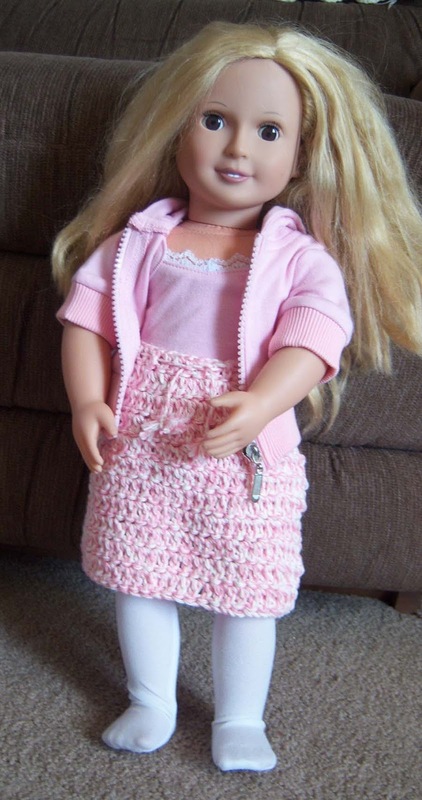 Here's her ebay store - Doll Clothes Sew Beautiful. 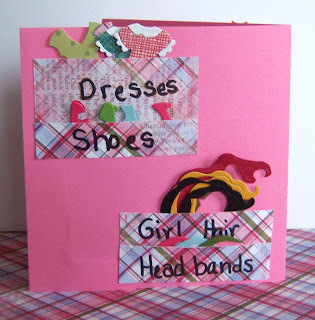 Now everyone knows that girls "need" to change their clothes quite often, so I plan to sew some more outfits for the dolls ---nothing too fussy as I don't think I have the patience for that! 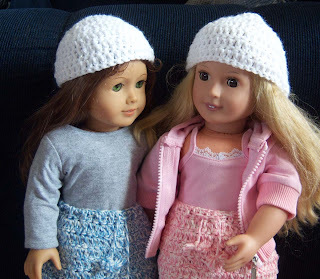 In the mean time I decided to try and crochet a few skirts for the girls, and I ran across a whole list of items you can crochet for dolls of several shapes/sizes. 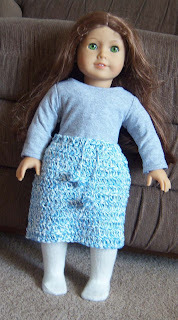 Here's the link for the dolls/doll clothes page at Crochet Pattern Central. 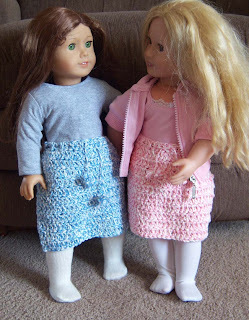 This link will take you directly to the page where I got the skirt pattern from ---- the one above is one row longer than the pattern calls for - the pink one is made following the pattern to a "t."
I also decided to make the girls hats..... (pattern on the same page as the skirt). I made mine in white so they would match anything the girls wore. The good thing is it doesn't take a whole lot of time to whip these up -- less than an hour for a skirt/hat ensemble! Hard to believe it's the start of a new year! I really can't believe how fast last year went, but 2011 here we come! Traveling......out of state for Christmas......short nights........fun family times......traveling again......unexpected overnight w/friends due to snow drifts......finally home again........unpacking and putting away gifts.......company for New Years......4 days of flu like symptoms......un-decorating my house.......cleaning....FINALLY back to a schedule today!! ...my mom really liked the first reversible purse I posted on here, but she was sure there was a way to add pockets and still keep it reversible......so I set to work figuring out how to do it in time to give one to her for Christmas. 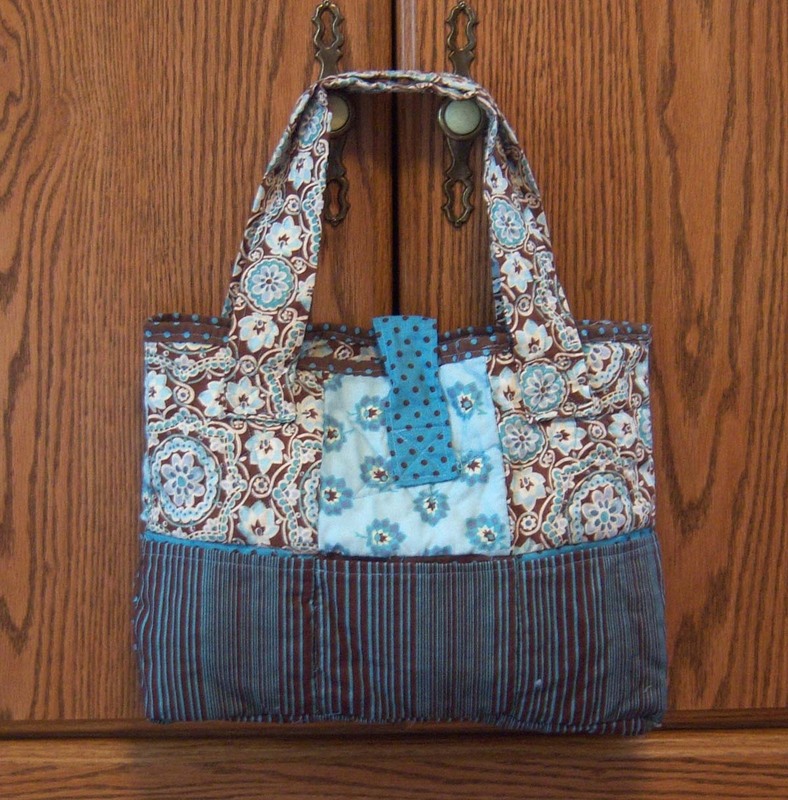 Trouble is: these kind of pockets don't look right on the outside of a purse so you can't reverse it! 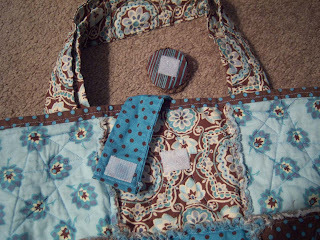 I decided to make the pockets as big as the squares and sew them into the seems so that when you reverse the purse they still look o.k. Here's a view of the purse reversed - showing the pockets on the back of it.... the striped material on the bottom 3 panels are the pockets. For my current purse I made six 5 in. 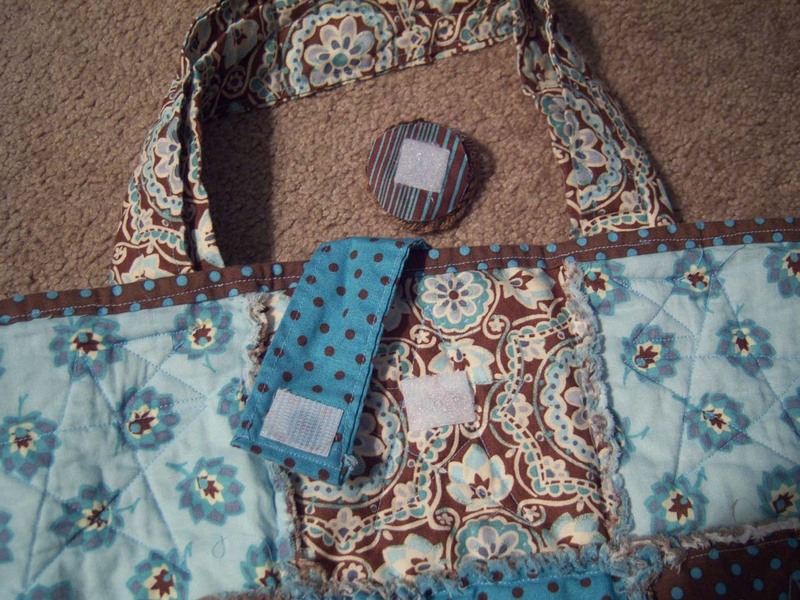 square panels for the front and back and sewed the purse together on the sides (instead of adding a panel. I made a chain stitch flower to decorate the closure and attached it with velcro....the cool thing is that by adding a piece of velcro on each side of the closure strap you can remove the flower, reverse the purse, and add it to the to the other side of the strap --- making the strap reversible too! My mom really liked it......guess it was a success! 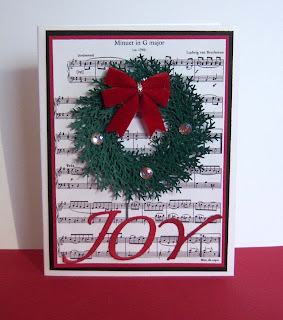 The two cards I made in the above design were the last Christmas cards of this year and also my very favorite ones! I actually made them for someone else to use - finishing them up two days before Christmas! 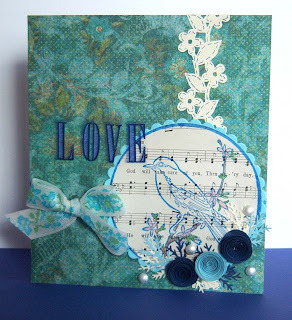 I love the music background paper and had seen it on a friend's project. I ask her where she had found paper like that and she thought she remembered printing it from a Dover Sampler. 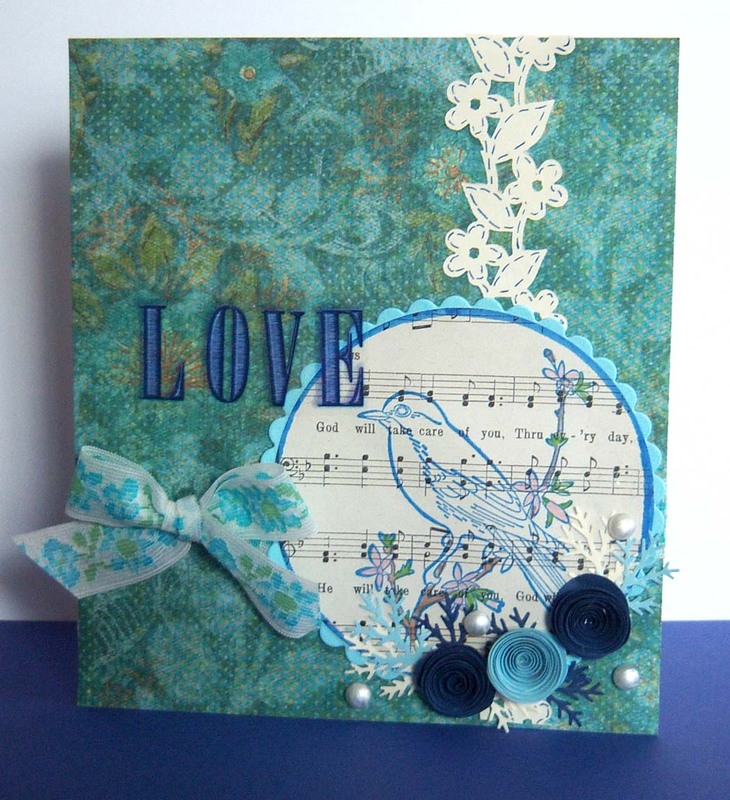 That's where I found it (and two other pieces as well), and I'm super-pleased with it as a background on this card!